NOTE: If you arrived here via a link from a site run by The Garden Seeds, know that I had never heard of them until they linked to this article without my permission. Because they sell seeds, the link to my site makes it appear as if I’m endorsing them as a seed source. I AM NOT ENDORSING THEM. I DON’T KNOW THEM. But, apparently, I can’t stop them from misappropriating my words (they include a huge quote). Sometimes the Blogosphere shows its seedy underbelly, and today is one of those days for me. I’ve been meaning to write about marigolds all growing season. Marigold varieties derive from two main species: Tagetes patula is the so-called French marigold species. These are the smaller, very spicily fragrant flowers often used as edging plants in borders. 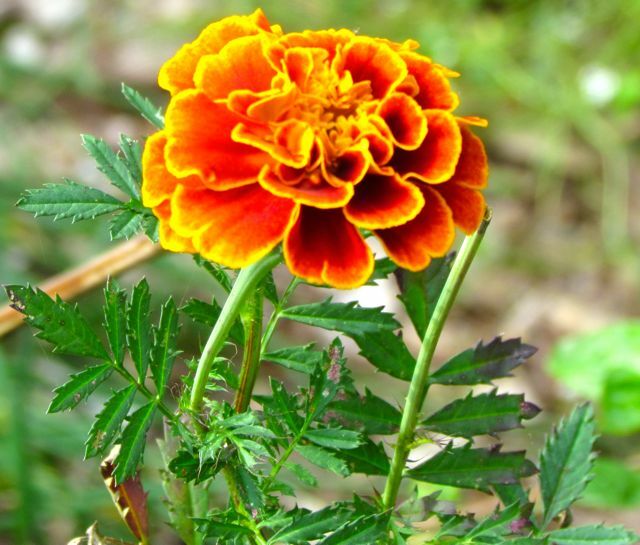 The so-called African marigolds are Tagetes erecta. These marigolds grow much taller, aren’t nearly as fragrant, and look more like chrysanthemums than marigolds to my eye. I put “so-called” in front of both common names, because these flowers didn’t originate in either France or Africa. Their natal origin is Central America, where they were discovered by Portuguese explorers in the 16th century. 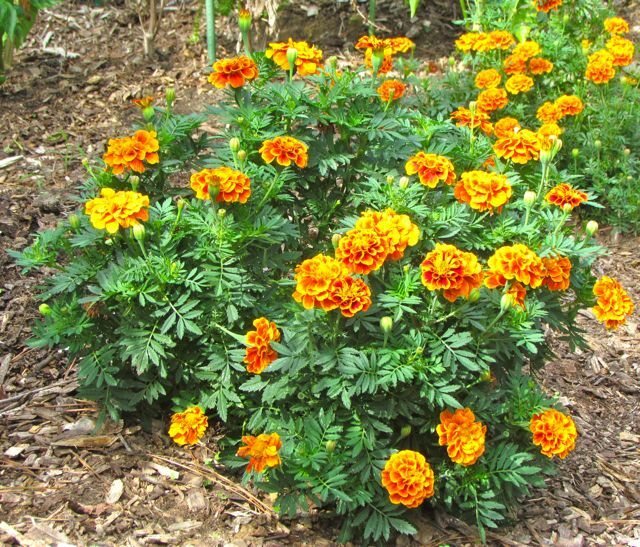 I love French marigolds, and I’m especially a fan of the “Queen Sophia” variety. I think the complex mix of deep orange and gold epitomizes all that a marigold should be. Combine that with non-stop blooms from spring to hard frost, and you’ve got yourself a winning marigold. In this gardener’s opinion, every vegetable garden should be full of French marigolds. The spicy fragrance apparently extends to emanations from the roots. Horticulturalists have noted that when Tagetes is grown in beds first, then tilled under, tomatoes planted in the same beds have fewer infestations of root-knot nematodes. Marigolds repel the bad guys and attract the good guys. I always plant marigolds at the bases of my tomato plants. They may repel nasty soil inhabitants, and they definitely bring in pollinators. This time of year, my Queen Sophia flowers are usually occupied by slumbering carpenter bees every cool morning. They are nearing the end of their life cycles, and I imagine they find it harder to find reasons to leave their fragrant orange-gold beds as autumn creeps close. I start my marigold seeds in my greenhouse, because I’ve found that small seedlings are a favorite food of slugs in my garden in early spring. As soon as my plants have some heft to them, the slugs don’t seem to bother them. My propagation chamber with the heating mat is usually full in spring, but the marigolds don’t require bottom heat to germinate. I just pop the seeds into moistened potting soil, set them on the greenhouse bench, and in just a few days, the seedlings appear. To encourage continuous blooming, snap off the spent flowers; you’ll release the spicy fragrance into the air — instant aroma therapy! I usually toss the spent flowers on the dirt beside the plant. Right now, I’ve got quite a few new marigold seedlings popping up near the mother plants. The first freeze will kill them. While the marigolds continue merrily along, the vegetables are most definitely winding down. But I’m still picking produce every other day. Today’s haul: 63 Sweet Treats cherry tomatoes (These plants have been nothing short of awesome this year. ), 5 Viva Italia tomatoes (No more reliable paste tomato exists. ), 2 Purple Russians (The surprise of the season — an heirloom that didn’t succumb to the summer. ), 3 small slicers (These have fallen victim to greedy squirrels; I’m not finding many ripe ones that aren’t half-eaten. ), 1 Carmen Italian pepper (Still many more coming along. ), 2 Apple peppers (Still a few of these coming too. ), a handful of Fortex pole beans (These are finally giving up the ghost after a spectacular season). And the biggest surprise of September: another Diva cucumber. Usually my cucumbers expire by late July. To still be harvesting tasty green cucumber beauties is astonishing to this gardener. I suspect that the heat and drought may have reduced the number of fungal diseases that usually kill my cukes. I was able to give them just enough water to keep them going through the worst of the heat wave. And now that the weather is cooling, they have responded with a new flush of flowers and fruits. Diva, my friends — it’s the cuke you want for your Piedmont home garden, I am here to testify! I’ve spent the last several days yanking out the weedy interlopers from my dormant veggie beds. Two days ago, I sowed crimson clover, which I always start this time of year. This is a so-called “green manure,” which means it adds nutrients to the soil when this annual dies back in the spring. It also serves to protect my soil through the winter, encouraging the activity of earthworms, preventing crusting of the top layer of the soil, and increasing overall soil health. I wouldn’t think of growing a veggie garden without this winter cover crop. I watered it in, and today I noticed that little roots are already poking out of the swelling seeds. Predicted rains over the next few days should encourage those roots to burrow deeply, producing enthusiastic seedlings to crowd out weeds and nurture my beds through the winter. I’ll close this miscellaneous post with a quick reminder to those gardeners lucky enough to be gardening within driving distance of Chapel Hill, NC: Don’t forget the NC Botanical Garden’s fall plant sale this weekend. You won’t find a better selection of native plants from woodies to wildflowers. And the money goes to keep this special place going. Ya’ll come out and buy some green goodies! This entry was posted on September 21, 2011, 4:01 pm and is filed under Favorite Plants, piedmont gardening, Vegetable Gardening. You can follow any responses to this entry through RSS 2.0. You can leave a response, or trackback from your own site. Oh, how I love that Queen Sophia! It’s good to see her face in the middle of all this winter. Thanks for the cheery image! Happy to oblige, Jenny. And I quite agree with you. I tried many marigold varieties before I found Queen Sophia. But now she is all I grow.